To train dogs, you need to have something that they desire and that you can control. It simply is not worth their while to expend energy for no reward; a past-time evolution weeded out many years ago. To make sure you have something that they want, you need to work on building an addiction to the things you can control, and control access to the things you can’t. Although there are many rewards for use in pet dog training, the three most common types are praise, food and play. Years of selective breeding coupled with life history determine that different dogs have different relationships with each of these rewards. Tasks that involve patience such as sit, stay, and walk to heel are best taught with food rewards. Tasks that involve getting a dog revved up and highly excited about the job in hand such as recall or agility tasks, are best taught with toys. The reason I leave praise out here is that praise has its place. But for many dogs, especially in over-stimulated environments, it can be entirely ineffective. Because most pet dogs live indoors with frequent access to human contact, praise and petting as rewards usually have limited value when training your dog in highly exciting environments. Compare this with the old days when most dogs were generally kennelled outside individually without any company. In that context, praise and petting during limited training time often served as the only physical contact available. Because dogs are highly social creatures that crave physical contact, this brief attention was hugely rewarding. Clearly, however, some dogs value praise above anything else but, in my experience, dogs that will do everything anywhere for praise alone are few and far between. So you are not a failure as an owner, and neither is your dog a ‘bad’ dog if he doesn’t do things for praise alone. The original dog training books were aimed at dogs that were trained for specific purposes such as hunting wildlife and herding. Back then, a good trainer’s mantra went something like “I never need treats to train my dog.” That, however, is not the same as not needing rewards. Some of the original trainers failed to acknowledge that their dog had been genetically selected to find the ultimate reward in the task they were asked to do. For a sheep dog, sitting still and stopping on command means subsequently that they get to herd the sheep which is their absolute favourite thing in the world. Gun dogs sit still and stop on command, and are then allowed access to wildlife. As such, although the original trainers were not carrying around bags of treats or toys, they were still consistently and constantly rewarding their dogs. It is an illusion that only bad trainers need rewards. In fact, all good trainers have been using them for hundreds if not thousands of years. As a dog owner in a busy environment, you have to manipulate what your dog will work for, if he doesn’t already find what you have available very appealing. Most commercial dog treats are too dry, too hard, too expensive and quite simply not rewarding enough. If you want to get your Stabyhoun excited and motivated by food, you need something great. Meat or cheese in tiny pieces are excellent – make them the size of a pea or smaller though. If your dog won’t eat treats, then you might need to manipulate how he gets fed and stop free access to food. To get your dog to become more food-motivated, you can hand-feed daily food rations in individual pieces as treats for training tasks. Within days, you’ll have a more food motivated dog. Then you can move away from hand-feeding food rations and use small tasty treats instead. Choose a toy and play with your dog in short sessions – stopping before your dog gets bored of the game. You then take that toy and put it away safely. Sounds mean? It is vital that your Stabyhoun’s favourite toy is not freely accessible as its value will then slowly reduce. 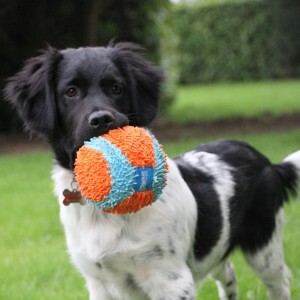 The best types of toys are tennis balls or rag-rope toys as they are small and easily replaceable. Play sessions in your house and garden should be short (5-10 minutes) once or twice a day. The more sessions the better and because the toy always goes away before the natural end of the game, the value of that toy naturally increases for your dog. They always want what they can’t have! If you’re in the park and your dog doesn’t want the food or toys that you have or doesn’t want to stay with you for your intrinsic value, then your dog should not be off the lead. A 10-metre training lead will allow freedom but also prevent him from accessing and prioritising his own rewards; running up to strange dogs and people, flushing birds or jumping in the canal. Remember, controlling the thing your dog wants most of all is essential for effective training. Control what he wants and you control your dog. Don’t spend too long in the park in the early stages – especially if your dog does not want the things you have. Go home and work on building the addiction to the things you can control. Train more in the house and garden where it is less exciting. Short term micro-management for long-term off-lead play for life. Training is a means to an end. If your dog categorically doesn’t want anything you have, don’t just take him to the park and let him race around rewarding himself with play from other dogs while he rehearses ignoring your calls. If he does not come back 9 times out of 10, he really shouldn’t be off the lead. You need to give as many rewards as it takes to get full control of your dog’s behaviour. It often surprises people when they first hear that in the initial stages of training, they might need to give their dog a treat every two seconds. This is necessary if your dog only has that kind of concentration and is finding distractions or other rewards elsewhere. Day one of training is all about finding a benchmark for the amount of rewards required to control the behaviour. You can then always expect more for less as the days go on. Only when your dog is switched on to the things that you control and finds this rewarding should you move onto phasing them down to a variable (random) reward system. Training is all about creating good habits that you want repeated. If you are consistent and manage your dog’s rewards, there will come a day when he will want what you are offering more than the distractions he finds in the park. The overarching aim of dog training is to get a dog that wants to do the things you ask, for the rewards you control. The most important thing is to be consistent. If the timing of your rewards is accurate, training will happen more quickly, and you will confuse your dog less. But don’t worry if your timing is sometimes slightly out. As long as you mostly get it right, a clever dog will eventually get it. And then, your dog can learn anything from you. Eventually you can even teach your dog how to fly a plane… or at least how to press an autopilot button.